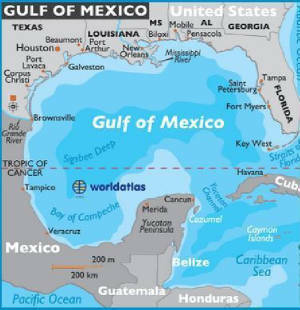 some of these fossils came out of Wiegand mines in Mexico. the smaller fossils are nearly complete, but the fossils in limestone / dolomite that are usually larger than two feet long, come out in several pieces. one of the Wiegand archeologists / geologists carefully and pains-takingly clean the chalk lime mud from around the fossilized bones of rare fish and the shells of rare oysters and clamshells. most are of the Cretaceous and Jurassic geology time periods. the dinasaur bones are separate from the fish because the fish lived in the sea saltwater, but the dinosaurs lived onshore.
" The Cretaceous is a Geological Period and system that spans 79 million years, from the end of the Jurassic Geological Period 145 million years ago ( mya ), to the beginning of the Paleogene Geol ogical Period 66 mya. The Cretaceous Period is the last Period of the Mesozoic ( geological ) Era. The Cretaceous Period is indicated by the letter K, for its German translation of the word "chalk", in the German language, "Kriede". 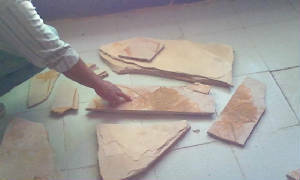 The German geologists were some of the most educated geologists in the historical earth world." hhmmmhhmm, is there anyone out there who can confirm the name of this fish? 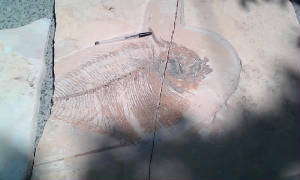 Fred presumes it is a deepwater fish fossil. It died about one hundred million years ago, more or less.